I've read many columns and papers about how devastating large losses can be to a portfolio when those losses occur early in retirement. Usually, this risk is referred to as Sequence of Returns (SOR) risk and it is illustrated by showing a few market returns and how they provide the same ultimate portfolio value no matter how they are ordered. Then, the column shows how the order becomes significant when we buy or sell stocks periodically from the portfolio. Hopefully, you followed my explanation in my two previous posts, Clarifying Sequence of Returns Risk Parts One and Two. I agree that large losses early in retirement can be potentially devastating, and that SOR risk is introduced when an investor withdraws constant-dollar amounts from a retirement portfolio. I just don't see them as the same thing. Let’s imagine two workers who retired on October 1, 2007, each with a 100% stock portfolio worth a million dollars. One plans to spend $45,000 every year from his portfolio. The other plans to buy a fixed annuity with the entirety of his portfolio sometime in the next month. As I explained in previous posts, the constant-withdrawal retiree is exposed to sequence of returns (SOR) risk. The fixed annuity buyer obviously is not. From October 8, 2007 to March 2 2009, the S&P 500 fell nearly 55% in just 16 months. Our two retiree-investors are both now looking at portfolios worth about $450,000 and I would argue that, despite having different spending strategies, they are about equally screwed. The risk of the sequence of future returns is of no consequence to the annuity buyer and for the constant-dollar spender, SOR risk will seem like a minor annoyance compared to his recent loss of more than half his portfolio. Their problem is clearly not Sequence of Returns risk as I have discussed it. I see their problem as having made an extremely large bet on stocks at the riskiest time in retirement and I refer to it as "early loss" risk. The bet is extremely large because the typical pattern for a retiree-investor results having his or her their largest portfolio value just before and just after retirement. 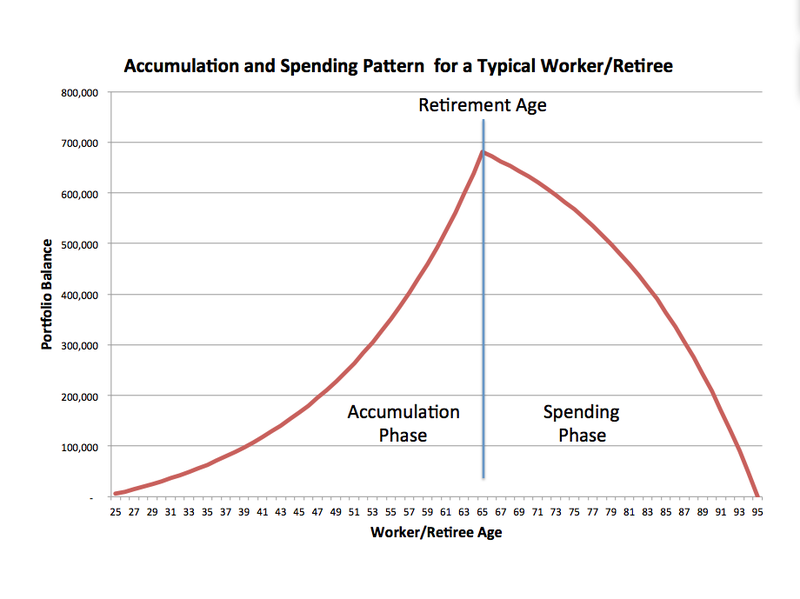 The following graph shows portfolio value for a worker who invests $6,000 a year while working, and spends $50,000 a year in retirement with a constant 8% rate of return. Even with significant changes to portfolio allocation, the worker will make his largest bets on the stock market (i.e., have the largest portfolio to invest) in the decade before and the decade after retirement. Why is early retirement the riskiest time? Ignoring the size of the annual bet, which is in and of itself an increased risk, portfolio values in the decades before and after retirement have the greatest impact on terminal portfolio value. Here’s a simple example. Assume that a retiree can earn 5% every year of a 30-year retirement with no risk and will spend $43,0001 each year. I replaced the 5% gain with a 30% loss in the first year of retirement, then moved the 30% loss to the second year, etc. To be clear, each scenario contains just one 30% loss and 29 five percent gains, with the loss marching through the years. 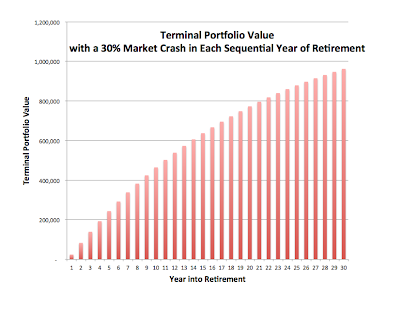 A 30% loss in the first year of retirement left only $24,000 in the terminal portfolio. The same 30% loss in year 30 leaves over $962,000. With no losses, the portfolio would have ended with a value of nearly $1.5M. As you can see from this simple demonstration, the earlier in retirement a major loss occurs, the greater the impact on future wealth. A 30% loss in year one had 25 times the impact of a loss in year thirty when comparing TPV’s. So, put these two charts together and you see that the typical retiree will place her biggest stock market bet at the riskiest possible time. That’s why I refer to this as “early loss risk” instead of SOR risk and why I see it differently than the SOR risk I have explored in my past few posts. The obvious solution to this problem is to lower stock allocations early in retirement and perhaps increase your allocation as early loss risk eases2. That is exactly what Wade Pfau and Michael Kitces recently proposed. To some extent, the differences between “my” SOR risk and SWR advocates’ SOR risk is semantic. They’re saying that if you implement a constant-dollar withdrawal strategy and have losses early in retirement you’re in deep doodoo. I’m saying that a large early loss is bad no matter what your spending strategy. In a more important way, they're different. Large early losses with a constant-dollar spending strategy frequently result in the retiree going broke, while losses with a strategy based on a proportion of remaining portfolio balance threaten the retiree’s annual income, while allowing her portfolio to survive. Either way, if you hold most of your wealth in stocks early in retirement, you have enormous risk, as many recent retirees and near-retirees learned in 2007. I was one of those, and it gave me an entirely new perspective on stock market risk. I held 40% stocks at the market peak in 2007. I recently advised a friend to hold 20% or less. It certainly changed my idea of “conservative allocation”. In my next post, "Sequence of Returns Risk: What's That Mean", I'll tie up a few loose ends on this topic. 1 I reduced this from $45,000 to avoid portfolio failure in less than 30 years for the worst case. 2 It never goes away. Whatever your current age in retirement is the riskiest investment year of the rest of your life. And I quote, "Dirk Cotton, a financial planner based in North Carolina, runs a thoughtful blog called The Retirement Cafe. 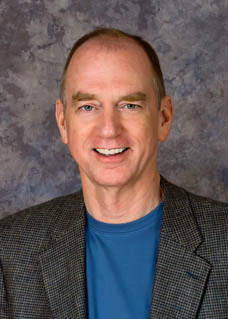 Recently, he has been writing on the idea of sequence of returns risk." This is so cool. I'm printing off a copy of the post to show my wife next time the subject of thoughtfulness is broached. But seriously, I am humbled and appreciate Wade Pfau's picking up my post. If I can convince you to follow Wade's blog, my work here will have been worthwhile. If you're interested in Sequence of Returns risk, I hope you'll read my series on the topic beginning with Sequence of Returns Risk Part One. I still have a few more posts to go on the subject before I finish. 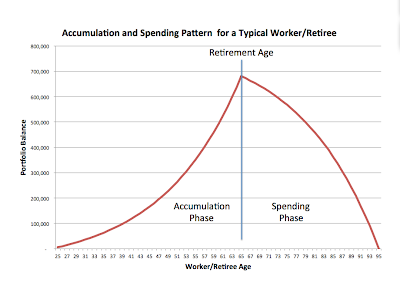 Part of my goal for this blog is to explain the financial issues of retirement in a way that anyone can understand. To make it more "accessible", as they say. I haven't done a great job of that with SOR risk so far because it's a pretty technical issue, but I hope to fix that. I have to read papers that Wade and others write several times before I understand them, and then cogitate, as my grandfather liked to say. I know most people have neither the time nor the interest to do that. I plan to tie it all together in a more accessible way in the final post on the topic over the next week or so that I will call "What's That Mean?" Please stick with me. Also, I have added a Follow Me by Email widget to the site if you would like to be notified of new posts. You're email address won't be used for anything else. I also added a small ad widget at the top left. If you see something interesting, give it a click. I'm not trying to make money with this blog, I'm trying to think through my own retirement finances and figure out what to tell my kids about theirs. I share my thoughts to help my fellow Baby Boomers. That and a great cup of coffee at Caffe Driade is a fun way to while away a few afternoon hours. As I mentioned in previous posts, the web is replete with columns about sequence of returns (SOR) risk showing that the order in which we experience market returns matters when we begin spending constant-dollar amounts from our portfolios. I previously showed how you can eliminate the SOR risk from terminal portfolio values (TPV) — the amount of money in your portfolio at the end of retirement — by basing your retirement spending on a constant percentage of remaining portfolio balance. But, I didn’t talk about the payouts of spending strategies, which is an important point missed by every other SOR risk column I have read. let’s look at both TPV’s and their payouts from both spending strategies (constant-dollar withdrawals and percentage of remaining balance withdrawals) using the 720 possible orders of these six returns. In the first scenario, a retiree has a stock portfolio valued at $1M and she withdraws $25,000 a year. The second is identical, except the retiree withdraws 2.5% of her portfolio’s remaining balance every year. Here are the results[i] for the 720 sequences for $25,000 withdrawals in graph format. 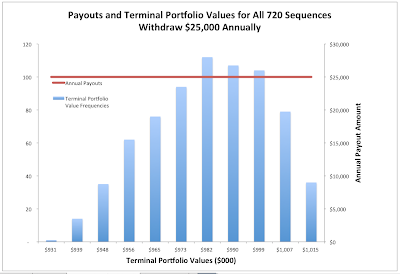 With constant-dollar withdrawal amounts, the annual payout is always $25,000 (by definition) but the terminal portfolio value depends on the order of returns. TPV’s ranged from $931,049 to $1,015,467. Remember what we are doing here is not looking at different sets of market returns, but at the 720 different ways this set of six returns can be ordered. And, here are the results[ii] for 2.5% withdrawals of remaining portfolio balance each year. With percentage withdrawals, TPV is $979,537 no matter how the annual returns are ordered, but annual payouts range from $16,553 to $36,986 and the present values (PV) of those annual payouts discounted at 2% range from $108,000 to $182,000. SOR risk affects payouts but not terminal portfolio values when spending is based on remaining portfolio balance. 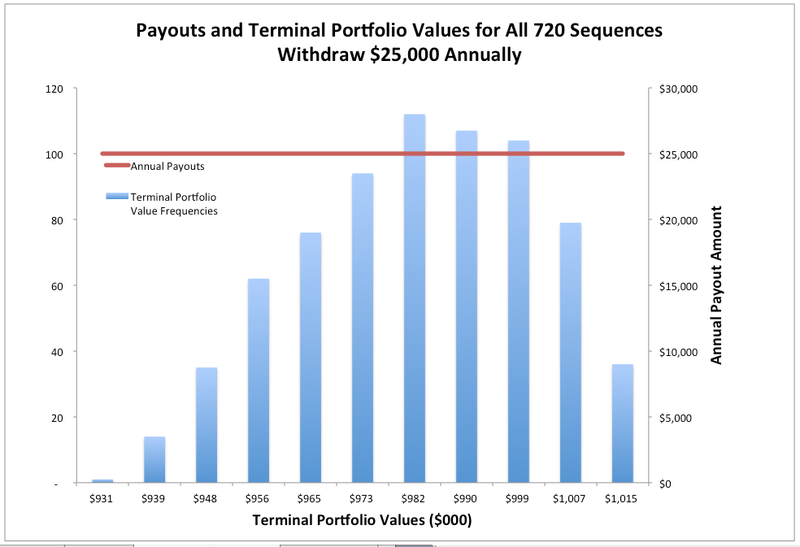 It affects terminal portfolio values but not payouts when spending is based on anything else. So, SOR risk is going to show up somewhere. We get to decide which place by picking a spending strategy. 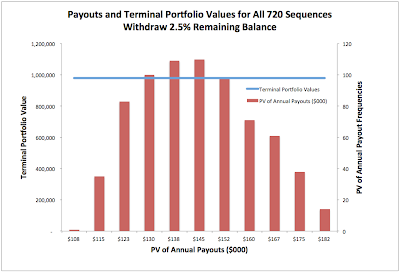 You might expect that eliminating SOR risk with respect to terminal portfolio values simply generates the same amount of wealth while varying the payouts and holding the TPV’s constant, instead of the reverse. When we transfer SOR risk from terminal portfolio value to payouts, we don’t transfer an equal amount of risk. Here’s an example. Since both terminal portfolio values and annual payouts are important, I measure retirement wealth as the present value (PV) of all payouts in retirement plus the present value of the terminal portfolio, as if it were paid back to the retiree after 30 years. I use a 2% discount rate and consider the two scenarios above (2.5% withdrawals and $25,000 withdrawals). 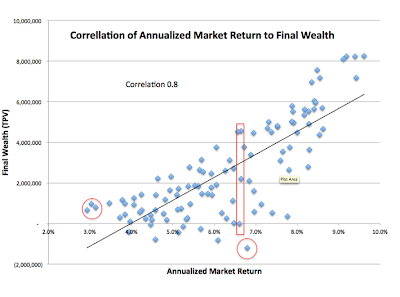 First, I looked at all 720 possible sequences of the six annual market returns. The ranges of outcomes are the result of SOR risk. They use the same 6 annual market returns, but in every possible combination. In particular, look at the Total PV column. 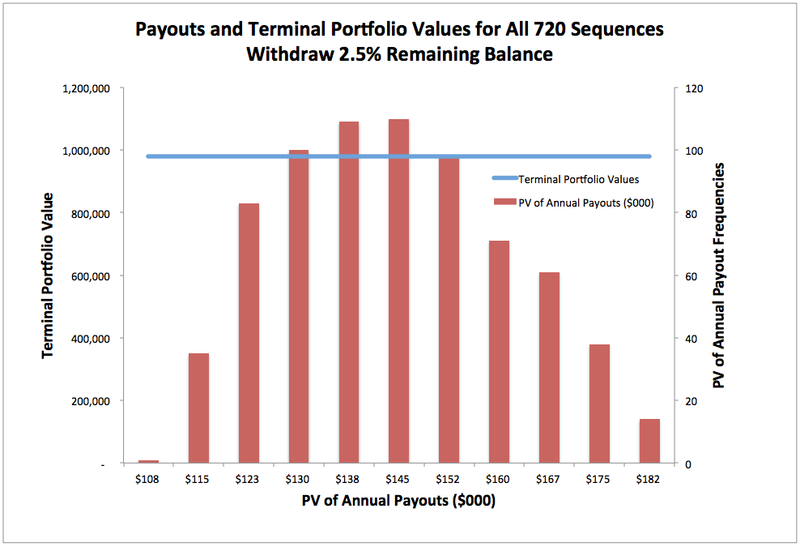 These are the ranges of 720 possible outcomes as measured by the combined present values of payouts and terminal portfolio values. The results aren’t very different after 6 years. Percentage withdrawals do only a little better by every measure. But recall from my earlier post that SOR risk grows exponentially with time and these differences might be much more pronounced over longer periods. Next, I looked at a thirty-year sequence. Fortunately, we don’t have to run all 2.65 x 1032 permutations of 30 years of returns (when is the D-Wave quantum laptop hitting the market?) because we know the best-case scenario is when the annual returns are ordered highest to lowest and the worst-case scenario is the reverse. Percentage withdrawals are significantly better in both the best and worst cases. Now, a couple of important points. First, while I had been using 4.5% and $45,000 in previous examples, I had to change the withdrawals to 2.5% and $25,000 in this step because the constant withdrawal portfolio failed in its twelfth year with $45,000 withdrawals in the worst case. This brings out an important point regarding the two strategies. The constant-dollar withdrawal strategy, as is well advertised, leaves the retiree flat broke before retirement ends 5% to 10% of the time. Percentage withdrawals never do, though payouts will decline as the portfolio values drops. This is the worst case of SOR risk. Not that constant-dollar withdrawal strategies cost more, or that we aren’t compensated for the risk, but that portfolio failure[iii] is a real possibility. Second, I am not trying to show that one of these two spending strategies outperforms the other. There is plenty of research to show that constant-dollar withdrawal strategies underperform. At these two extremes, in this specific example, percentage withdrawals look much better, but there are plenty of sequences in the middle where constant-dollar withdrawal shows better results, including the actual 1979 to 2008 order, where $26,842 withdrawals generated a PV of $5M compared to $4.7M for 2.5% withdrawals. I will note, however, that I have tried many 30-year sequences of returns and I am yet to find a set of returns where percentage withdrawals did not dominate constant-dollar withdrawals in the best and worst-case sequences using present value of combined payouts and TPV’s. What I am trying to show is that shifting SOR risk from terminal portfolio values to annual payouts isn’t a wash. Given the 30 annual market returns in this example, 2.5% withdrawals provided outcomes from $3.6M in the worst case to $8M in the best. That’s the range of outcomes if we remove SOR risk from terminal portfolio value. $25,000 withdrawals generated about $1M in the worst case and $6.1M in the best. So, switching from constant-dollar to percentage withdrawals not only switched SOR risk from TPV to payouts, it provided higher value and lower risk. And it completely avoided portfolio failure. That’s consistent with the many studies that show constant-dollar withdrawal strategies underperform. Notice that the differences in sequence of returns risk is much more pronounced at 30 years than at six. Since SOR risk is partially the result of the uncertainty of stock prices along the path (it isn’t present in a buy and hold strategy) that is what we should expect. So, we can eliminate SOR risk from terminal portfolio values, or eliminate it from annual payouts, but not both. If we eliminate it from annual payouts, we introduce the risk of portfolio failure. By basing our spending strategy on a constant percentage of remaining portfolio values, we can shift SOR risk to annual payouts, where it seems to do less harm. Personally, I’d prefer risking my annual income to risking the source of all future annual income, even if it were an even trade, but it is not. Next up: Sequence of Returns Risk or Something Else? 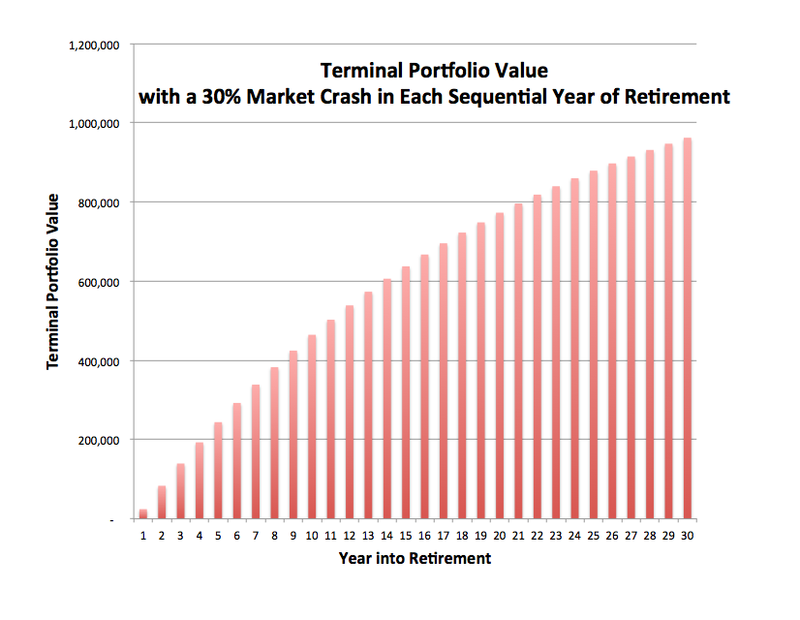 [iii] By “portfolio failure” in this case, I’m referring to depleting a portfolio before the end of retirement.